Once again I've been late jumping into the micellar water party, Bioderma isn't readily available in the UK and I couldn't justify the price. So as a cheaper alternative I picked up L'oreal's offering last month in Asda when it was on offer to shake up my facial routine a bit! 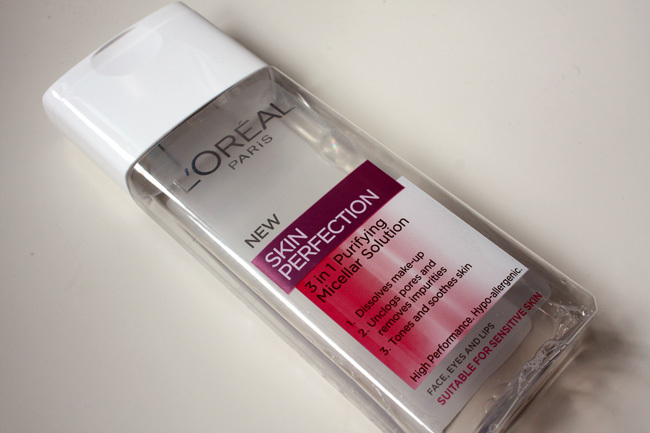 The L'Oréal Paris Skin Perfection 3 in 1 Purifying Micellar solution (woah what a mouthful!) is a cleansing water, which you apply to cotton wool and gently wipe across your face. It really does dissolve your make up, and makes easy work of even waterproof mascara (simple hold over eyelids for a few seconds and then wipe). My skin hasn't been irritated and it doesn't sting my eyes - it's hypoallergenic so really gentle and suitable for sensitive skin types. No nasty strong cleansing smell either. Even though it's gentle after using it my skin feels clean and there's no oily residue some cleansers leave behind, just clean, tone skin. The only thing I don't like about it is the lid, it pours out way too much product and there's no way of controlling it - meaning you waste a lot and it doesn't last as long as it should! I bought this one 3-4 weeks ago and I'm nearly out. 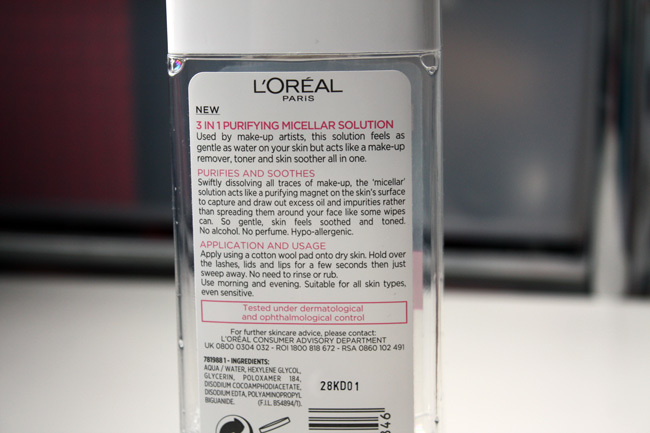 Overall I like the L'Oréal Paris Skin Perfection Micellar water, I think water cleansers are going to be a permanent fixture in my daily routine from now on. You can pick this up in boots, superdrug as well as supermarkets, full price is £3.74 but it's often on offer. I think I'm going to try Garnier's Simply Essentials 2 in 1 Make-up Remover version next, I've heard good things about it, plus it's in a HUGE BOTTLE! Also, ditto! I'll be trying out the Garnier one next too, :) Twinsies! lol dont worry I take mine off in bed too and I've had exactly the same issue! !